News from the . 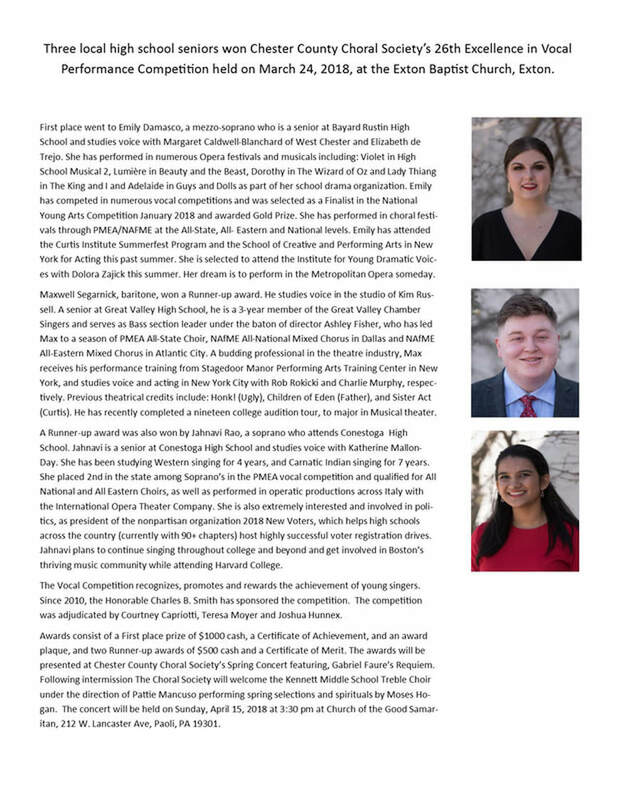 . .
For more than 20 years, the Chester County Choral Society has hosted the Excellence in Vocal Performance Competition to recognize and encourage talented high school seniors who reside, attend high school or study music in Chester County, PA.
All winners are required to perform an audition piece at the Choral Society’s Spring Concert on Sunday, April 28, 2019, at 3:30 PM. ​"To sing like this, in the company of other souls, and to make those consonants slip out so easily and in . . . According to a study by the National Endowment for the Arts, one in 10 American adults sings weekly in a chorus. For most, choral singing begins in a school chorus, but millions of people carry their love of singing into adulthood. The broad appeal of choral singing is based in the unsurpassed opportunity it gives each singer to participate in an activity that involves them artistically, builds community, and results in a product of great beauty. In working toward a beautiful choral sound, people contribute to an artistic product greater than themselves and forge friendships that change the course of their lives. The synergy of this musical mission infuses choral organizations with energy and purpose that result in extraordinary contributions to their communities - through stellar performances and recordings of great works, the creation of new repertoire, innovative educational programs, and cooperative partnerships with other community organizations. Choral groups and choral singers are diverse in the broadest sense: involving the old and young, in myriad musical styles from classical to gospel. Some choruses employ professional singers with significant music background and training. Professional choruses often set the standard of quality and beautiful choral sound. Some choruses are rooted in volunteerism, and their mission is to involve singers from the community who share the love of singing. Others aim to make the move from performing with only volunteer singers to including a core of paid professional singers. All of these various groups promote cultural excellence, community and national pride. Their performing venues are equally diverse -- from community festivals and shopping malls to major concert halls -- ensuring that choral music touches all members of a community, regardless of economic status, age, or ethnic origin. The fact that choral singing is a communal activity is especially significant today when we increasingly rely on Internet-based communications, rather than face-to-face interaction. Several recent studies have shown a significant decline in civic engagement in our communities. Robert Putnam, Harvard's Kennedy School of Government scholar (best known for his book, Bowling Alone) asserts that the significance of choral singing goes beyond music making, and even beyond the arts. He sees group performing as contributing directly "whatever the makeup of the group" to the social trust and reciprocity that is the basis of civic engagement. Putnam's work shows that the mere existence of choral groups helps foster America's democratic culture (see his web site, www.BowlingAlone.com). Putnam's colleague Tom Sander, executive director of the Saguaro Seminar, gave a keynote address, "Choral Singing and Civic Engagement," at the Chorus America Conference in Toronto this past June. The Saguaro Seminar recently published a report, "Better Together," chronicling the "erosion of social capital in America" and outlining ways to reverse those trends. You can access this report through the web site, www.bettertogether.org. Other experts agree that political sociologists bemoaning the decline of community in America would do well to check out their local choral scene. For example, "Singing in a choir" is listed in the New Hampshire Charitable Foundation's publication Social Capital, a checklist of activities that can promote social "connectedness." To sing like this, in the company of other souls, and to make those consonants slip out so easily and in unison, and to make those chords so rich that they bring tears to your eyes. This is transcendence. This is the power that choral singing has that other music can only dream of."